Jazz artist Maggie Brown bursts into song at one point during our conversation in Bridgeport Coffee. She uses her phone for digital accompaniment, pulling up a track that “speaks to the young people”—a jazz rhythmic loop—before launching into the first verse, “I’m fed up with all this bad news/ The crime here got me singing the blues/ I wish the headline could report on something good, instead of shooting in my neighborhood.” The coffee shop table transforms, momentarily, into a one-person stage. She’s free-scatting over the beat, fingers drumming the table before interrupting herself. “Here come his words,” she says, before launching into the verses of her father, the late South Side jazz legend Oscar Brown, Jr.
It’s an improvisational demonstration that encapsulates the musical heritage that Maggie grew up in, a mix of jazz, poetry, and hip-hop; but more than that, it’s a confluence of what currently and has always preoccupied her: music as a family affair, and in particular, the legacy of her father. 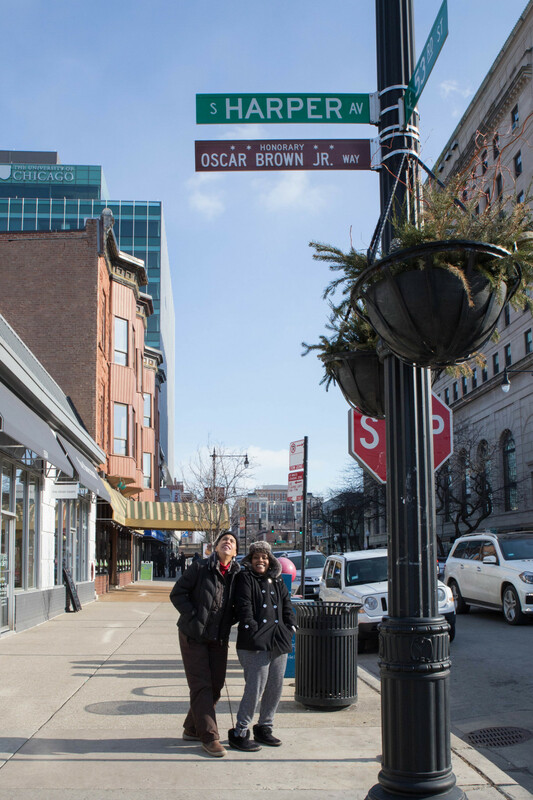 While each member of the Brown family has some presence in the music industry—Maggie is an accomplished performer, as is her step-sister Africa, and so was their late brother Oscar III—the familial constellation revolves around Oscar Brown, Jr., his work, and, now, the effort to preserve it. The South Side jazz giant, composer, and activist factors into nearly every conversation that Maggie has about her solo career, but one senses that it’s not an unwelcome association for her. While Maggie admits that she’s often on the receiving end of calls to “do her own thing” and “step out of your dad’s shadow,” she also expresses a belief in the continued ability of her father’s work to be a healing salve—a belief that roots her commitment to spreading it. “I think it’s the rising,” she says. “The fact that the poetry and music is stuff [that] rises to our need for being able to articulate who we are, and how we feel [as] black people. And also to show our beauty and to redeem, to rise above this struggle. So his material, it spoke to our human condition—his stuff ties us back to the Great Migration, his stuff ties us to Chicago in the early 1900s when he was growing. Even when you look at ‘Work Song,’ the men working on the chain gang and some rural situations too.” And indeed, much of Brown’s work vacillates between intimate historical commentary and incisive contemporary criticism of black history. A recent staging of Brown’s In De’ Beginnin’ at eta Creative Arts, for instance, was a retelling of the Genesis story from a black perspective, which involved mixing scripture, black vernacular, and iambic pentameter. Maggie’s advocacy of her father’s material has been in the works for quite a while now, beginning far before 2005, when Brown passed at the age of seventy-eight. Maggie recalls family meetings where cataloging her father’s deluge of poetry, songs, plays, and essays would come up. It occurred to a young Maggie (about eighteen or nineteen at the time), that Brown’s body of work was “massive and kind of undiscovered.” Brown, known for hits like “Work Song” (popularized by Nina Simone), “Signifyin’ Monkey,” and “The Snake” (quoted by Trump on the the campaign trail, an event the Brown family worked to send a cease-and-desist letter in response to), had in fact produced a far larger corpus of work than was ever published or known by the public. In a 2015 interview in the Tribune, Maggie noted that in many ways, it was Brown’s anti-commercial, anti-business inclinations that had contributed to the lack of publication and publicity of his work during his lifetime. It was this attitude that left behind a goldmine of unpublished material after Brown’s death—and left his family with the immense task of sifting through his creative output. Naturally, the works were in varied forms—typewritten manuscripts, handwritten notes, floppy disks (“You remember those?” Maggie asks), and computer-typed documents, all of which were scattered between residences in Chicago and Washington, where Brown had lived. At the end of it all, Maggie estimates that they had catalogued some one thousand poems among other written works, most of which have never been published. To this day, this archiving work remains central to the popularization of Brown’s work that Maggie envisions. Having a collection that is easily available to the public is her ultimate aim, and to that end, Maggie is now looking to the digital realm. “A cybrary,” in her words, would be the goal—having Brown’s work live on in pixelated posterity. And in talks with her for this digital push is the Rebuild Foundation, an arts and cultural development organization started by Theaster Gates and behind community-focused projects like the Stony Island Arts Bank. It’s a move that has been part of Maggie’s attempt to broaden the reach of Brown’s works and bring it into the contemporary arts and music scene of the city, rather than have it remain in the annals of forgotten history. In the background of these new revivals of Brown’s work, though, and behind the intimate and communal atmosphere surrounding his legacy, there have been complications about the legal management of his artwork. A legal quagmire emerged following Brown’s passing in 2005. Vehemently against the commercialization of his art, Brown’s attitude of institutional resistance had bled over into other spheres of his life. He didn’t believe in paying taxes, for one—Maggie explains that he believed black people, who’d been enslaved and then suddenly made taxable citizens without recompense shouldn’t have to pay taxes—but, more relevantly to the current legal situation that Maggie and Africa deal with, he hadn’t left a will. That wide-open range quickly formed the battleground for family disputes. All currently unpublished material by Brown is owned by the family as a whole under an imprint called Bootblack Music. From time to time, it turns a profit from artists choosing to cover this material, or sample it, or otherwise utilize it. (Maggie relates to me a bizarre instance where rapper Cassidy’s sampling of Diana Ross covering Brown’s “Brown Baby” became grounds for licensing.) After his death, because of a lack of a will, intestacy laws kicked into effect, which meant that Brown’s estate was equally divided between his late spouse, Jean Pace Brown (Africa’s mother, now deceased), and his remaining children. Maggie tells me that the struggle over the estate was largely one that emerged after her stepmother’s passing, when a stepsibling residing in California (a daughter from Jean Pace Brown’s first marriage) began staking claims to the rights to Brown’s creative work. Maggie declines to go into detail, but tells me that the dispute was protracted and tumultuous for the family. Within this climate a third-party representation company called CMG Worldwide was brought in as an independent, third-party mediator, through whom requests to use Brown’s work now go. Maggie serves as co-manager of Bootblack Music, with the stepsibling based in California pulling co-manager duties. It’s not the ideal settlement for Maggie and Africa, but it’s one that they’re learning to work with in the mission to popularize their father’s work. Whether going easy or toeing the line, the Browns will now find themselves dealing with this triangular legal-representative situation for at least the next five years—the duration of the current contract. Even as they adjust to the legal complications of managing their father’s legacy, the biggest obstacle Maggie and Africa face in exposing more people to their father’s work may be the passing of time. It’s easy to feel that as years pass and the generation more familiar with Brown’s work begins to fade, so too will his legacy and memory. Maggie is taking cues from younger Chicago- and South Side-based artists in learning to counter that. Particularly, she mentions that new methods of distribution are allowing artists to reach a larger audience than ever before. The conversation, naturally, turns to Chance the Rapper, whom Maggie “is so proud of,” having been friends with his mother, Lisa Thompson Bennett. She talks about giving music away, and how initially unpalatable that notion was to her. The same stubborn optimism and belief in the pure restorative ability of music persists in Maggie. In our conversation, she expresses a desire to one day have a brick and mortar center in Chicago that continues her father’s legacy of “edutainment”—educational entertainment. It would be, she envisions, a space that could teach you how to “deal with your talent,” using artistic gifts in a productive manner, in much the same way her father’s community-centered arts work functioned when he was alive. The words of her and her father present a refreshingly reassuring vision of music—listening to Maggie, one feels that the kind of spiritual salvation both she and Africa talk about is within reach. But with the knowledge of the kind of corporate and organizational obstacles that the sisters now face, one only hopes that the glimmering strength of Brown’s music and legacy can pull through until there’s enough of an organizational groundwork to circulate it far and wide. 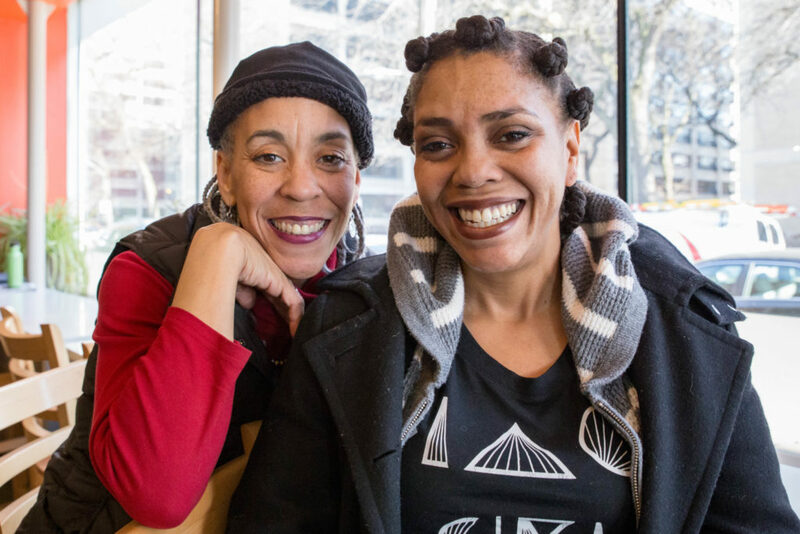 Until then, the sisters continue pushing and performing, while, behind compromises and complication, Brown’s musical healing continues to work its magic. Great article about one of Chicago’s greatest songwriters and an important family legacy. Chicago’s amazing Oscar Brown Jr. I saw him at The Crystal Palace at Armitage and Lincoln in 1966 when I was 16! I loved him from his records but seeing him is person was life changing. An absolutely incredible artist effects you in ways that reverberate through your life. I bought all his records but that night was special. He was his own man. A man who observed life not just with his senses, but with his brain and spirit. HIs spirit awaken him to what is wrong in the world; his brain with how to expose what was wrong. Always been a fan of Mr.Brown.Mostley his jazz items.Actually he wrote words to my late uncle ( Duke Pearson/ Blue Note Recording artist and a @r man during the sixties ) most famous song ” Jeannine” which still remains a jazz standard.Dont know how this came about.Always wonders how it happened.Although I’m not in charge of his estate.Im holeheartly do the best to help keep his legacy alive.